In the mood for something on the lighter side? Each of our salads are made fresh to order! 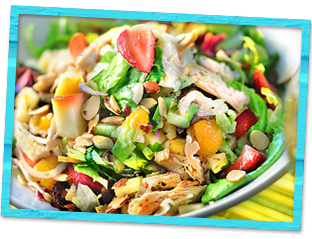 Try our signature Calypso Chicken Salad or our Sailor Salad with Grilled Steak. A Side Salad can be ordered: A La Carte, as a substitution,or in addition to any entrée, handheld or burger purchase. All items may vary by location, please contact your local Cheeseburger in Paradise for location specific menu information. Click here to contact the location nearest you. * These items are cooked to order; however consuming raw or undercooked meats and seafood may increase your risk of food-borne illness.